How do you clear your browser cache? Cache: Browsers try to speed up the loading process for webpages. 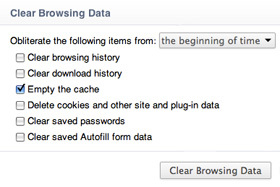 The first time you visit a site, your browser will save (cache) pieces of the site to your computer. Your browser does this because it can display the files stored in its cache much faster than it can pull fresh files from a server. When developers make updates that affect the way your course runs, you will not be able to see the updates until you clear your cache. Internet Explorer 9 or 10 click the gear icon in the top right. Note: Remember to refresh the page you are viewing after you clear your cache.